Discussion in 'Distributed Computing' started by Gilthanis, Apr 5, 2018. All teams should sign up for the Pentathlon until 27 April 2018 using this registration form. Subsequent submissions are possible until 02 May 2018, but the project suggestions can not be taken into account. The BOINC Pentathlon starts on 05 May 2018, 00.00 UTC, and ends on 19 May 2018, 00.00 UTC. So, it will run for exactly 14 days. ). While every discipline starts and ends at 00.00 UTC, the projects may be announced at different times (00.00 UTC, 06.00 UTC, 12.00 UTC, 18.00 UTC) to avoid that some teams are always surprised in their sleep. The project appears to have a limit of 6 work units per CPU thread. If you want a set and forget project for the event, then choose this one. The project with the most votes that provides workunits with a quorum of 1. This may be a GPU project if no GPU project with a quorum of 2 got more votes. This project is CPU only. (not selected defaults to 8 hours)" drop down box to the time you want. Last Pentathlon there was a 100 task per host download limit. If someone confirms it being different, let me know. We are seeing different numbers this go round so nothing confirmed on hard limit yet. This project uses both CPU's and GPU's. GPU's are not much better than the CPU's but at least will allow for more PPD. Or you can use the CPU's at another project like the Numberfields while running the GPU at Asteroids. The GPU project with the most votes. If this project has been chosen for the sprint, the CPU project with the next most votes that has not been chosen for another discipline is chosen instead. This project uses both CPU's and GPU's. If anyone from another team would like to participate in the Pentathlon due to their team not joining in and would like to remain anonymous, I will be providing details on how you can run your hosts under our HardOCPtest account when projects are officially announced. Please ask if you need specific instructions on how to do it as not everyone is familiar with BOINC. To use your weak account key on a given host, find or create the 'account file' for this project. This file has a name of the form account_PROJECT_URL.xml. The account file for PrimeGrid is account_www.primegrid.com.xml. Registration is live. Please chime in on what projects you prefer the team to vote for. I will try and get a tally soon and just submit like the last couple years. DENNIS does not qualify due to it only being BETA work right now and has not had much work yet since restarting things. We also get a 4th choice if you want to tac another one on your choices. My votes are NFS, Rosetta, RakeSearch, and Amicable Numbers. We'll see starting to get warmer here. Haven't made my mind how many systems I'll run. ChelseaOilman , we need four projects to vote for. What other 2 would you like to pick? I hope they choose rosetta as the marathon. The other three projects that I would go for are primegrid, rakesearch and seti (need to make sure everyone is using the optimized GPU application). So, one bio, two maths and one ET. Votes are for Universe, NFS, RakeSearch and Seti based purely on my setup's potential for output rather than sentiment towards a particular project. Starting to prep some quads for the show. 4 of the 5 are installed and going again. The 5th needs completely built as it was a castoff server recently that I haven't had time to do anything with yet. That will get rectified tomorrow. phoenicis and ChristianVirtual like this. phoenicis and Gilthanis like this. 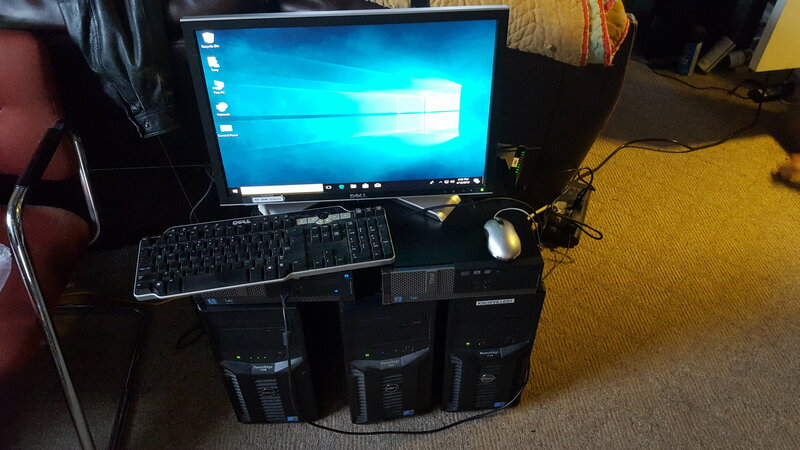 Looks like I have scrounged up another quad core i5 Optiplex 390 system to set up. Home with sick kiddo today but will try and get it set up at some point this week. I would like to get us signed up and listed within the next day or so. Does anyone else have any votes to add? I have two GPUs on that right now working [H]ard, and will continue to try to add more very soon. Red Falcon , do you have 3 more options? University@Home, SETI and Rosetta, please! GPUGrid is not one of the options this year. Oh shoot, don't know how I missed that one - scratch that, University@Home. I would like to get the voting wrapped up today and us signed up tonight. We could use a few more voters because there is a tie on the 4th project currently. If that doesn't change, I will have to make an Executive Decision. Universe - chosen because there was already a math project and this is CPU only making it 2 CPU choices and 2 GPU choices. Teams can still register and vote for 7 more days and can register up until the 2nd. We are now just under 14 days until the competition starts. Do not put off testing your rigs and learning how to tweak them. If you have any questions in advance, please ask now so that we have time to not only walk you through it but you have time to fully test your system leading up. You may even want to take this time to practice your bunkering techniques at a few projects just so that you know you have it down. I am relatively new to folding.. can I download a bunch of tasks now, complete them and then upload after the starting date and have them count? How does that work? Yes, you can. There is a limit of 6 tasks per thread. There are few ways to overcome this. See strategy forum. Just acquired another castoff laptop from work. Latitude E6510 with an i5 M460 @2.53GHz that I need to setup. PecosRiverM made a decision yet? Anyone else in XS wanna join us? Jeeper's daily bulletin translated in English. Original article in German is here. Our team is not mentioned here, but that's fine. We like to be the underdog.. It's not so easy to find a beginning every year for the Daily Bulletin on the BOINC Pentathlon. One of the first exercises is to search for the meaning of the number that defines this pentathlon. This year, ladies and gentlemen, it's nine. For the ninth time, the ultimate competition takes place in the Boinc world. The number 9 is the smallest odd composite number and the smallest odd composite number which is not a Fermat pseudo prime number. Alright? Well, if that's too mathematical, take a look at the natural sciences. Yes, there were 9 planets and maybe there will be 10 next year; all a question of definition. In China, the 9 is assigned to the dragon. Is this perhaps an indication of what we are facing this year? But the dragon will not have it easy, because the 9-headed hydra from Greek mythology might have something against it. As always, the challenge is the same for all teams. The teams expect 5 disciplines: marathon, swimming, sprint, cross-country and the city run. As the marathon progresses across the distance, the teams in the other disciplines have to face tough matches for 3-7 days. New this year: the announcement period for some disciplines has been shortened. This means having to act even faster for the teams, but also more tactical opportunities for the brave. You will have to look for who wrongly distributes his resources. If you do it right, you can make legendary triumphs. After a clear victory last year, SETI.USA faces the challenge of defending the title. The expectation is certainly not only high among the Americans. Only Planet3DNow and SETI.Germany will do anything to steal the beef from the burger. The big unknown is the power of Team China. Can the Chinese play a role in the fight for total gold? Do you already have the strength for the victory? And which other team can cause a stir in the overall ranking this year? L'Alliance Francophone, the Czech National Team, Overclock.net, BOINC@Poland or ???? The past year has already shown the trend. It's getting more and more exciting in the disciplines. More and more teams have realistic chances on precious metal. It is therefore not very brave of me to say, "Here is the mail, go out." The days are over of SUSA, SG or P3D determining everything with the medals distributed among themselves. By clever tactics, surprises are always possible, no, even guaranteed. Overclock.net's individual victory in cross country last year and Team China's silver medal in the sprint are warning examples. Rarely has the situation been as unclear as this year. Increased crunching costs have been added to many teams. Some were just about to hoist the white flag and capitulate. Also, for organizers, it will not be as easy to find suitable projects, but real crunchers do not give up that easily. It's time to dust off the hardware, secure the sockets, stock up a large supply of caffeine and best to send the woman to the salon or the man in the pub. The heroic battle for credits in the service of science awakens weary spirits. Anyone whose fingers do not tingle in the face of the challenge is already dead. Do you want to feel life? Let's go. It's going to be exciting at the Boinc Pentathlon. BTW, there are now 31 teams signing up. If we can get at least a medal finishing, that will be super-awesome. Go [H]ordes!!! phoenicis, motqalden and ChristianVirtual like this. Did we kill it? I can't log into my account on their website right now. I can get in. I know last night it was off an on but it would come back up quick. Maybe tonight is having similar issues as everyone continues to hammer the servers. Must be. Up now for me too.